A bursa usually sits between a tendon/muscle and the bone. It helps to protect the tendon from rubbing against the bone. The bursa is a sac of fluid so it acts similar to a small cushion, proving protection and dampening from surrounding friction and pressure. The ischium is a bony protuberance at the bottom of the pelvis (lower part of the bottom) and the bursa that cushions the area is known as the ischial bursa. Inflammation of this bursa is known, as you can imagine, as ischial bursitis. 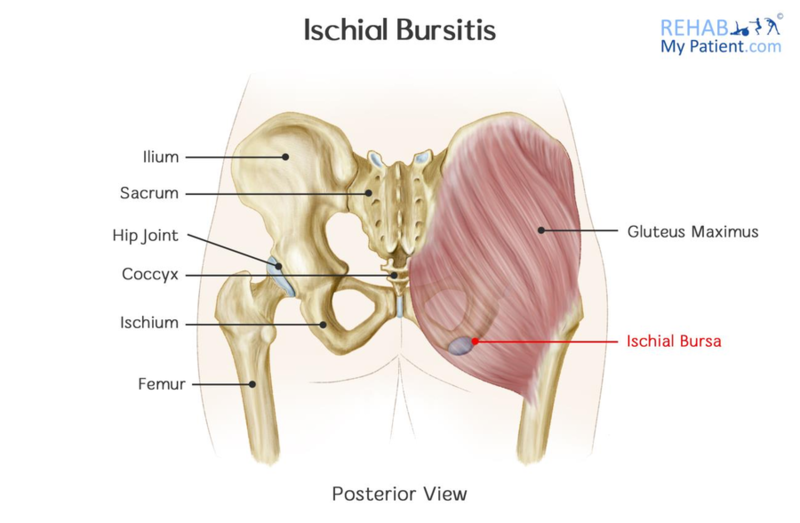 Ischial bursitis is not a particularly common bursitis, but does occur. It typically affects people who sit for long periods of time, overweight people, and people with sedentary lifestyles. People who sit on hard chairs or stools are also susceptible, and hence the lay name is known as "Weaver's Bottom". Patients typically report pain underneath or at the bottom of their buttock, close to where the buttock meets the back of the upper thigh. The hip is a ball and socket, and anatomically it sits at the front of the pelvis, in the groin region. At the side of the hip (technically speaking the side of the upper leg bone is called the femur) is the greater trochanter. The ischial tuberosity is the sitting bone, located in the lower middle part of your buttock muscle. Between the ischial tuberosity and the buttock muscle lies a sac of fluid known as the ischial bursa. Ischial bursitis symptoms can be varied depending on the patient. Patients typically report increased pain on sitting, and tenderness in their buttock when they touch it. Apart from physical examination, a clinician may want to scan the area using an ultrasound scan although this would be unlikely if the diagnosis is clear already. Non-steroidal anti-inflammatory medication is the first port of call for treatment, and one such option is ibuprofen. As inflammation is reduced, symptoms will improve. Please take as indicated on the box and consult a doctor. Apply ice to the affected area for 5-10 minutes at a time three to five times per day to help reduce inflammation.. Make sure you wrap the ice in a thin towel to prevent an ice burn from occurring. You may need to ice the area every day for around 6-12 weeks. Avoiding hard seats or stools is one of the best ways to reduce the pain from bursitis. If you do need to sit down for long periods, use a pillow or a doughnut cushion. Also sit upright and maintain a good posture while sitting. Follow the advice of your physical therapist on which stretches and strengthening exercises to do. Physiotherapy, manual therapy and sports massage may all help. Electrotherapy such as ultrasound, and shockwave might also be of benefit. A very useful way to reduce inflammation from bursitis is to have a carefully placed steroid injection. Used in combination with therapy, this is likely to have the best results for persistent bursitis. It will typically not be used as a first line approach, and is rarely performed by a general practitioner due to the position of the bursitis. Move that hip! The hip joint being stiff can contribute to causing ischial bursitis. It is therefore important to keep the hip nice and mobile. Walking and swimming can often help. Stretching the muscles in the painful area will help to reduce irritation to the bursa during movement. The key muscles to stretch are the gluteus maximus (buttock) and hamstring muscles.Your therapist will guide you through these stretches. Holding the stretches for 30 seconds at a time, twice a day is optimum. Your therapist will guide you. Strengthening weak muscles and improving muscle imbalances is the next step. Usually this will focus on the muscles that rotate the leg, such as the gluteus medius, but will involve strengthening the gluteus maximus and hamstrings. It is important that the initial painful phase is over before a starting strengthening programme. Core strengthening can help to stabilise the pelvis and hips during movement, which reduces the amount of friction between muscles and bursa.